Antwerp is known for producing new and upcoming fashion designers. in the late eigthies the so called ‘antwerp six’ placed the spotlight on antwerp, a city which was never known as a fashion capital. Although the group worked tirelessly throughout the 80s to produce consistently ground-breaking collections, it was not until 1986 the group rented a van and headed straight for the ‘British Designer Show’ that the movement truly gained momentum. There they presented their collections and marked a new era. Their aesthetics differences aside, the common ground was clearly the experimental silhouettes and conceptualism. The group included Walter van Beirendonck, Ann Demeulemeester, Dries van Noten, Dirk Van Saene, Dirk Bikkembergs, and Marina Yee, all graduated from ‘the Royal Academy of Fine Arts’. 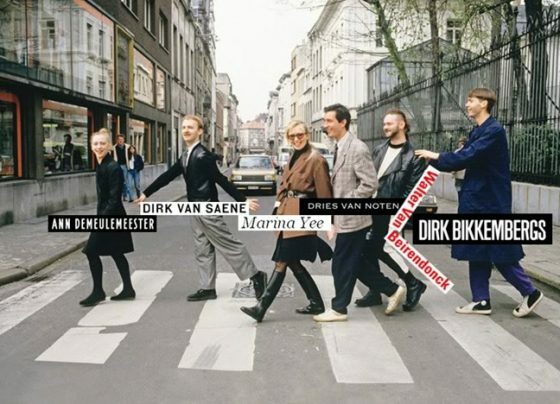 Marysia Woronieczka, a british fashion agent wanted to represent them but couldn’t pronounce all these designers’ names and started referring to them as the Antwerp Six. in 1988 they decided to take a chance and presented their collections at the Saint James & Albany hotel. After the success of their presentation at the parisian hotel the designers began to part ways.